Someone is ready for spring. There is no secret there! Any chance I get to walk outside without a coat I will take it for all it's worth! Sure, I'll be running back inside because I forgot my phone on the coach and I will probably grab my winter jacket so I don't freeze my appendages off, but... there was that 2 minutes of pure joy where the bare skin on my forearms got to feel the sunlight. The sun is a deceiving thing. It's all... "Hey girl, come out side and play." and then when you listen it's like you get slapped in the face with a wet glove. Not pleasant. Not that I would know what that would feel like, but I can imagine. So, until the temperature gets about 40, I will be wearing a jacket. But not in my pictures, of course. 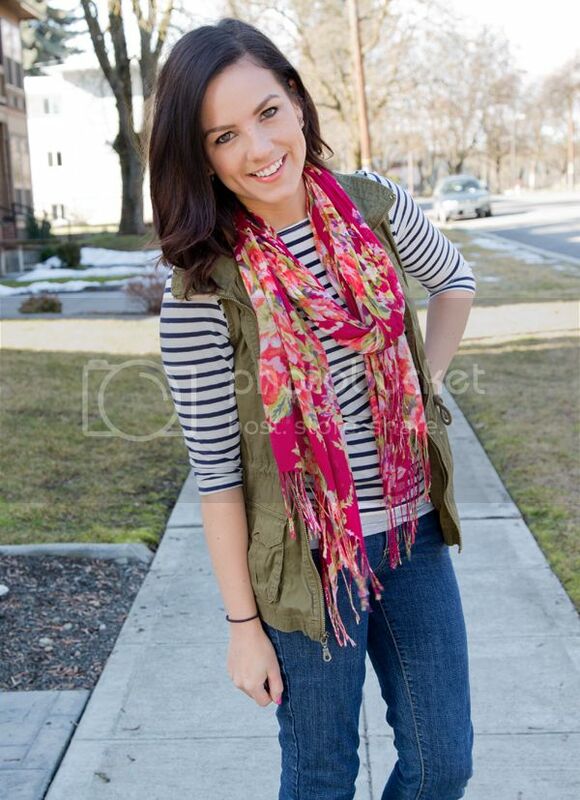 I would definitely get hypothermia for the sake of my pictures. Because I'm (should be) committed. I hear ya! I'm tired of ruining a cute outfit with my winter jacket. Lets go, Spring! Must you always be so pretty? Jeez... haha. I love this outfit. 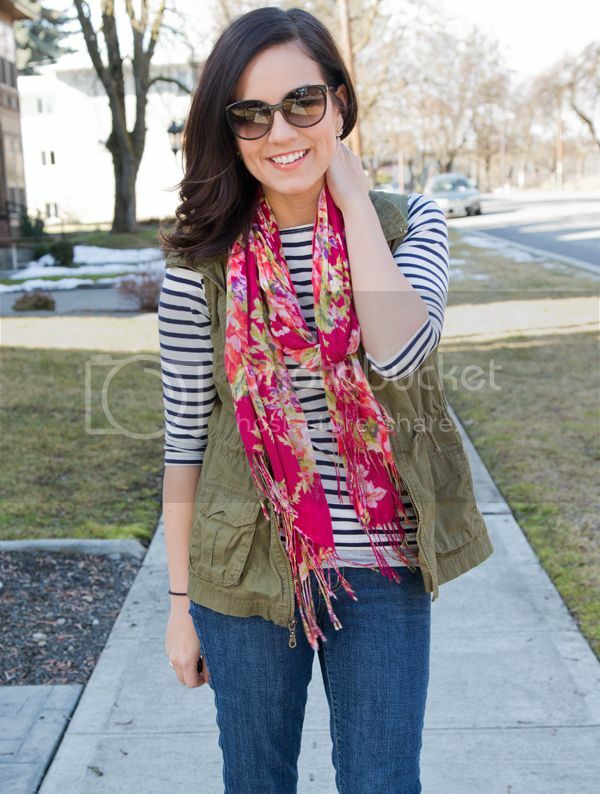 The vest + scarf=killin' it giiiiirl! I'm soooo ready for spring in Seattle. Today is beautiful but still chilly. I'd take sunny cold over rainy any day though. Also, your lip gloss/color is perfect. Gosh I luuuuurve your outfit! Love this outfit! I'm ready for spring too! Oh and your sunnies look PERFECT on you! this whole look is perfection! 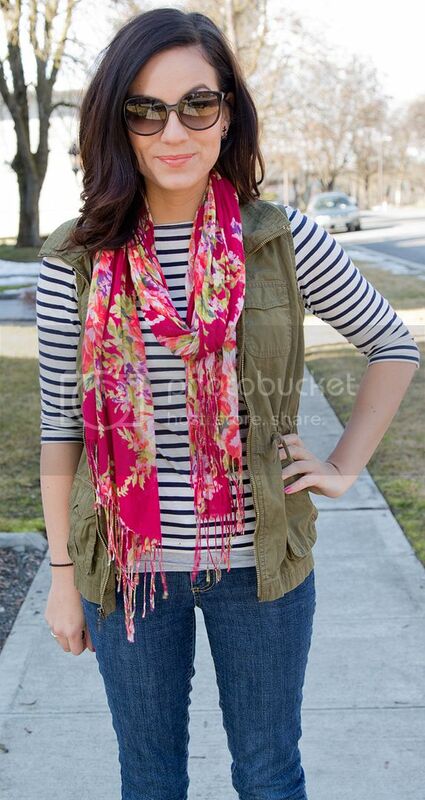 love pink & hunter green, stripes & florals, and print & print!!! !